Quality Fabricï¼100% Egyptian long-staple cotton. We use fine yarns made with long staple fiber cotton and a gorgeous sateen weave. The subtle stripes make them look extra luxurious. The material feels very breathable and stays cool. Our sheets get softer with each wash, lifetime softness, resist fading, and theyâre incredibly eco-friendly. 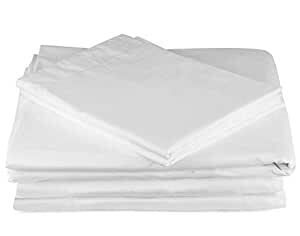 The density of these sheets is 400TC. The denser the fabric, the more expensive it is, and the corresponding sheets are better and softer. Single-strand weaving makes it more dense, more breathable and wicking. Fitted sheets feature all-around elastic and deep pockets to fit oversized mattress up to 16″ inches deep. The corners have elastic bands that help to keep the sheets from shifting. Elastic bands can withstand at least 500 tensile test. It will never slide no matter how you twist and turn in your bed without popping off. Soft color: White is meaning for pure, healthy and clean. With white bedding sleeping, its space is helpful for calming the mood, soothing the mind and the pain. At the same time, the white color is a versatile color, which is very conducive to the color matching of the room, giving you the greatest color matching flexibility. Customer Service: 100% satisfaction and money back guarantee. Please contact us if there are any problems with the purchase and we shall strive to make it right within 24 hours. Fabric: 100% Egyptian long-staple cotton. Egyptian long-staple cotton is known as âPlatinumâ in cotton. The bedding made of Egyptian long-staple cotton is very soft and comfortable. The 100% cotton fabric is natural plant fabric, suitable for any crowd. It is chemical-free, not allergic, and washable. It will not pill even though washed many times.